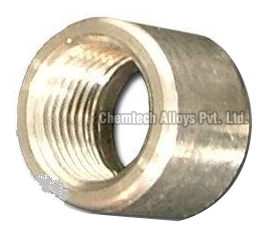 Chemtech Alloys is a distinguished Manufacturer, Exporter and Inconel Half Couplings Supplier in Mumbai. We bring to you an assortment of Inconel Half Couplings that are manufactured to precision with high quality raw material, keeping in view the industry standards. We offer superior quality Weld and Inconel Half Couplings in different diameters and thicknesses, as per the client specifications. Our Inconel Half Couplings are used in various machines such as printing, automated and assembly machinery, etc. We supply all sizes of consignments at your doorstep within set time frames. The range of Inconel Half Couplings can be bought from us at the most competitive price.